Glaucoma is a progressive disease, which causes optic nerve degeneration over time. The optic nerve is the main nerve responsible for vision. It is like a cable connecting the eye to the brain. As it degenerates, vision loss occurs. This loss may be very subtle at first, and therefore may not be noticed until much later in the disease. Like a "thief in the night", glaucoma damage may creep up on people without being noticed. There are many different types of glaucoma that have many different causes. The most common types are inherited or run in families. This means that if you have a relative (especially a parent) who has glaucoma, you should be checked to see if you have any signs of early glaucoma. Some people with diabetes who develop retinal eye disease may develop neovascular glaucoma. Uveitis or eye inflammation can cause glaucoma as well. Some people are born with glaucoma. If I have glaucoma does that mean I will be blind during my lifetime? In most cases, glaucoma takes years to develop. There are also many different types of glaucoma and a spectrum of disease from borderline to an advanced stage. "Knowledge is power" in the case of glaucoma. The best way to prevent ongoing damage from glaucoma is to pick it up early enough to treat. You should have a good screening eye exam by an Optometrist, especially if you have a family history of glaucoma or other diseases, like uveitis (eye inflammation) or diabetes. Your Optometrist will be able to tell you if you are at risk for developing glaucoma, and may refer you to an Ophthalmologist or Glaucoma Specialist for further testing. What are the key risk factors for glaucoma? Does glaucoma only affect older people? What are some of the types of glaucomas? Glaucoma can affect all ages, from newborns to the very elderly. Newborns can be affected by congenital glaucoma which is a type of glaucoma that they are born with. Children or young adults can be affected by juvenile glaucoma. People diagnosed with glaucoma in their 30's and upward usually have other delayed onset types of glaucoma such as Primary Open Angle Glaucoma (POAG), Pseudoexfoliation (PXF) Glaucoma, Pigmentary Glaucoma, Acute or Chronic Angle Closure Glaucoma (A/CACG) and Mixed Mechanism Glaucoma. Glaucoma worsens with time and increasing age, and at a faster rate if left untreated. There are other types of glaucoma that are associated with diseases like diabetes, such as neovascular glaucoma (NVG) and rheumatoid illnesses, such as uveitic glaucoma. Glaucoma can also be caused by chronic use of steroids: steroid-induced Glaucoma. Why is it important to lower eye pressure in glaucoma? One of the main risk factors that can cause progression of glaucoma and vision loss is high eye pressure. Normal eye pressure runs between 10 and 21 mmHg. In patients with glaucoma, this pressure is often higher than 21 and needs to be lowered. However, not all patients with glaucoma have high eye pressures. This type of glaucoma is often called Normal Tension Glaucoma, but is likely just another form of Primary Open Angle Glaucoma. Even with this type of glaucoma, the best way to prevent progression of the disease is to lower the eye pressure sometimes to slightly subnormal range (eg. 7-9mm Hg). Really low pressures are not healthy either (eg. 6 or lower) since they can cause wrinkling of the inner eye layers, and poor vision as a result, along with other problems. If eye pressure is high in glaucoma, wouldn't I be able to tell? When eye pressure increases gradually, people often have no symptoms at all, apart from occasional eye discomfort or slightly foggy vision. Often these people are discovered to have high pressures on a routine eye examination. Having a routine eye exam is very important, since diseases like glaucoma cannot be diagnosed early without proper screening because there are often no warning signs before its too late. Glaucoma is like "a silent thief in the night" for this reason. However, if there is a sudden rise in the pressure, which can happen with certain types of glaucoma (for example, angle closure glaucoma or neovascular glaucoma), there are symptoms of intense pain, headache, decreased vision and can even nausea and vomiting. This type of problem needs emergent attention and anyone experiencing this should go to his/her local emergency department. Many over the counter drugs advise not using them if you have glaucoma. Should I avoid all these drugs if I have glaucoma? If you have narrow angles or angle closure glaucoma, then you should not be using these over the counter medications. However, if you have had laser or surgery to fix the narrow drainage canals, then it is safe for you to use them. These drugs often have components in them that can cause dilation of the pupils. Dilation of pupils can cause the drainage canals to completely close in people who have untreated narrow canals (angles). If they close completely, this can cause the eye pressure to suddenly rise and cause pain, headache, loss of vision, nausea, and vomiting. If this happens, you should go to your nearest emergency department immediately. What is the best way to measure eye pressure? The most accurate way and the current gold standard for measuring eye pressures is "Goldmann Applanation Tonometry". First, numbing or freezing eye drops are applied, with an orange dye (fluorescein). A tube-like structure on the microscope is put up against the eye with Cobalt blue light shining behind it. This presses gently against the cornea to measure the amount of pressure needed to flatten the front of the eye. You will not feel this at all since the eyes are numb from the eye drops. This measurement closely corresponds to the pressure inside the eye. This is most accurate for eyes that have a corneal thickness that is within normal range. What is pachymetry and why am I being asked to have this test? Pachymetry is a measurement of the central corneal thickness. If the cornea is too thin, the measured pressure may be falsely low; if it is too thick, the measured pressure may be falsely high. It is important to measure the corneal thickness by a pachymeter to understand how close the eye pressure measurement is to the actual eye pressure. The cost of this test is not currently covered by Manitoba Health. This test is strongly advised for a proper glaucoma evaluation. How good is the "airpuff" method of pressure checking? Are there other ways of measuring eye pressure? A tonopen is a handheld pressure-taking device. Our technicians use this to check eye pressure prior to dilating the eyes or after laser procedures. Numbing eye drops are used for this test. The tonopen has a very small tip covered by a disposable latex sleeve (not suitable for patients with latex allergies). This sleeve is changed between patients. The tip of the tonopen touches the centre of the eye a few times and lets out beeping signals when the information has been received. The patient is looking straight ahead and does not feel anything. The technician may have to lift the upper eyelid if the patient is squeezing the eyes closed. 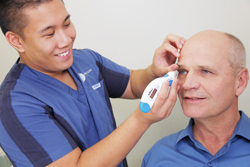 The iCare ® device is used to check eye pressure in patients without the use of numbing eye drops. 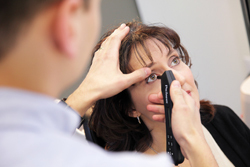 A disposable thin probe (changed between patients) is used to touch the eye very fast, several times. This generates a pressure reading that is reasonably close to the Goldmann applanation reading. This is a good method of testing eye pressure in children, and also in anyone who has sensitivities to the eye drops that are used. How are the instruments cleaned between patients? Everything that touches the eyes is soaked in hydrogen peroxide and thoroughly rinsed prior to use. This kills 99.9% of bacteria and viruses that can spread and cause disease. Some instruments have disposables covers that touch the patient, which are changed between uses. Some of these are made of latex, therefore please let us know If you have a latex allergy. Unfortunately, glaucoma cannot be cured. It is a progressive disease, which keeps causing damage to the optic or eye nerve, until a patient loses vision either partially or completely. It is usually very slowly progressive, and most people do not suffer significant vision loss until they are older. However, some people have very aggressive disease and can lose vision at a young age. The only way to tell what type of glaucoma you may have is to get regular eye check-ups. Therefore, it is very important to have a routine screening test with an Optometrist to make sure you do not have glaucoma. If your Optometrist has any concerns, (s)he will refer you to an Ophthalmologist for further testing, assessment and consideration of treatment. Does glaucoma affect one or both eyes? Most types of glaucoma usually eventually affect both eyes, though one eye may be more affected than the other. How do you treat glaucoma to prevent loss of vision? Although glaucoma cannot be cured, if it is picked up early and treated early, a person has a good chance of maintaining excellent vision throughout life. The only target for glaucoma treatment at this time is lowering eye pressure. The eye pressure can be lowered by eye drops, laser procedures, pills, or failing these options, surgery. Does marijuana use help lower eye pressure? Is this a good treatment for glaucoma? Marijuana can certainly lower eye pressures. However the pressure lowering effect from marijuana only lasts a few hours. Therefore, a person would have to literally take marijuana every 2-3 hours around the clock to maintain good eye pressures. As marijuana has many deleterious effects on the brain and other organs, especially when taken so frequently, this would not be an effective treatment for glaucoma in the short or long term. For this reason, use of medical marijuana for glaucoma treatment is NOT recommended. What do I do if I miss my eye drops? If you miss your glaucoma eye drops by up to 3-4 hours, simply take the drops you missed. If you miss it by more than this, simply resume the next dose. Try to place your drops where you are able to remember to take them. For example, place them in your bathroom beside your toothbrush, so you can remember to take them when you brush your teeth. Occasional misses (eg once a month) will likely not have much of an effect on your overall problem. However, if you miss drops regularly and often, this will cause your pressures to go up and down. This instability is not healthy for your eyes, and over time can cause you to lose vision. Glaucoma cannot be cured: we can only treat it by lowering the eye pressures with the use of eye drops, laser or eye surgery (usually in that order). Unfortunately, since we can't cure glaucoma, it will get worse over time, just not as fast with treatment. If we are successful and regular with treatment, it is possible to maintain stability over time so that things change so slowly it almost looks like it is not changing. This stability will promote good vision throughout your lifetime. The key to having stable vision, however, is to be regular with your treatment and keep the pressures low and steady with regular use of your eye drops. What types of lasers are there? Can they replace the need for eye drops? Peripheral Iridotomy: This procedure is offered for people who have a very narrow drainage system and are at risk for developing acute angle closure glaucoma. This is a very bad type of glaucoma, which causes an abrupt rise in pressure with headache, eye pain, nausea and vomiting, and can cause sudden and permanent loss of vision. This laser procedure can prevent angle closure glaucoma and is done in the office by your Ophthalmologist. Selective or Argon Laser Trabeculoplasty (SLT or ALT): These types of lasers attempt to improve the efficiency of the drainage system to lower eye pressure. They are usually used in addition to the use of drops, if drops alone are not lowering the pressure. The pressure lowering effect of these lasers are often temporary and may last for months to years. While ALT is usually done in two sessions per eye, SLT can be done in several sessions and can be repeated. SLT is considered a less damaging laser than ALT (and is preferentially offered at GEM Clinic). 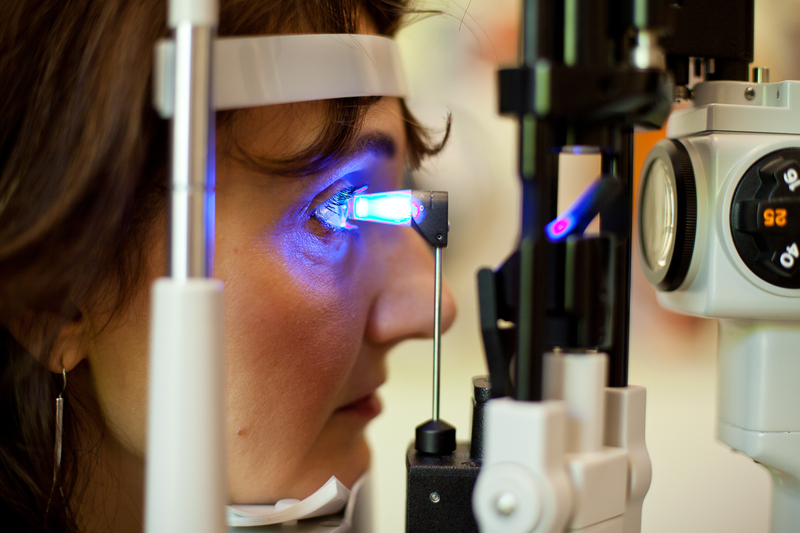 This is an office procedure that your Ophthalmologist can perform. Diode Laser: This is usually offered for pain control for end stage glaucoma with high eye pressure, but occasionally may be used as a last resort to lower eye pressure where surgery is too high risk for further vision loss. 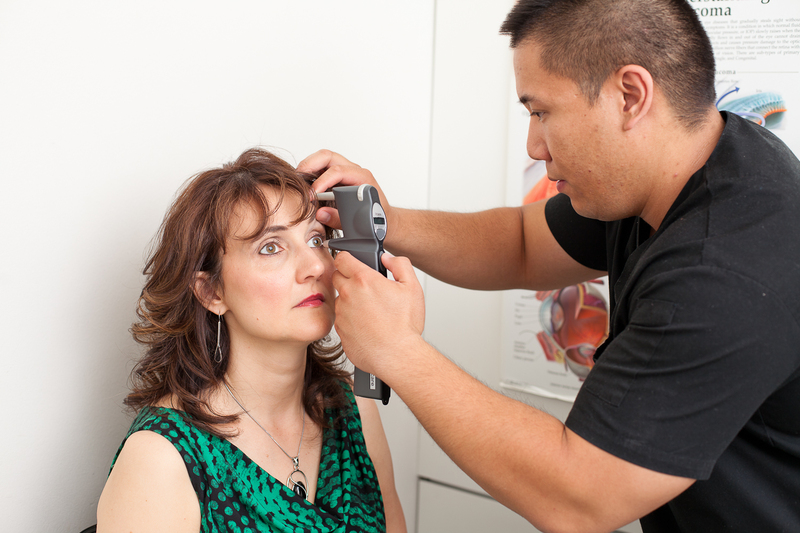 This laser is usually performed in the hospital as an outpatient procedure performed by your Ophthalmologist. What types of surgeries are available for glaucoma? The goal of glaucoma surgery is to lower eye pressure. This is done by creating a new "filter" or "drainage" system in the eye. The two most common types of glaucoma surgeries are offered and explained below. Trabeculectomy surgery: This surgery creates an alternate drainage pathway for fluid from inside the eye to drain just under the skin (conjunctiva) of the eye, through a "trap-door". No implanted device is used. However, anti-scarring chemicals are used at the time of surgery and sometimes afterwards to prevent scarring and closure of the "trap-door". Glaucoma Drainage Implants: When the risk of scarring or failure of the trabeculectomy surgery is considered high (for various reasons, including young age, multiple and long time drop usage, inflammatory or neovascular types of glaucoma, previous failed trabeculectomy), you may be a better candidate for a glaucoma drainage device like an Ahmed Glaucoma drainage implant or a Baerveldt Glaucoma drainage implant. These are silicone devices that channel fluid out of the eye through a tube that is implanted inside the front (or in some cases the back) of the eye, directing the fluid to an area just under the surface "skin" (conjunctiva) of the eye. Combined Cataract and Glaucoma Filtering Surgery: Sometimes you may need to have cataract surgery at the time of the glaucoma surgery. This will slightly lengthen the surgical time, but can be combined with either of the above procedures. How low should the eye pressure be? The normal eye pressure range is between 10 to 21 mmHg. However, for patients with so-called "Normal Tension Glaucoma" or progressive glaucoma, eye pressure should be lowered into the low normal, or even slightly subnormal range. If a patient has normal pressures, but still seems to be experiencing damage to their optic nerves (measured by visual field progression or HRT/ OCT imaging studies), pressures will need to be made even lower to protect against further progression. If optic nerve damage occurs, can this be fixed? Unfortunately, once the nerve is damaged, it cannot be repaired at this time. There are some exciting new developments on the horizon in the area of stem cell research, which may eventually find a way to heal nerve and brain tissue, however at this time there is no treatment for optic nerve damage. All treatments focus on saving what vision is left, and protecting the amount of nerve that is still alive. How do you measure vision loss? The optic nerve is the main nerve responsible for vision. It is like a "cable to the brain", taking the images to the brain for translation and interpretation. The nerve has several testable functions including visual acuity (tested by reading the eye chart), pupil reactivity (tested by shining a light on the pupils), colour vision (tested by reading colour plates) and peripheral or side vision (tested by the visual field analyzer). Is there any way to pick up evidence of glaucoma before damage and loss of vision occurs? There are some new imaging technologies, which can detect the degree of nerve damage and its progression and help pick up evidence for glaucoma before any vision is lost. HRT or Heidelberg Retinal Tomography is one excellent tool to monitor progressive nerve damage. This test is done every 6-12 months and can pick up subtle changes in the nerve thickness over time, by comparing sequential images. This instrument uses scanning laser technology, and is very safe. This technology can help identify glaucoma at its very early stages. The best way to prevent progression of glaucoma is to start treatment early. This test is recommended for new patients, and especially on patients with early-moderate disease, or patients who are only suspicious of glaucoma based on the appearance of their nerves (while everything else is normal). This test may not be very helpful in patients with advanced disease and already marked damage to their nerves, or in patients with anatomically abnormal nerves from other conditions (such as high myopia or near-sightedness). OCT or Ocular Coherence Tomography is another type of advanced imaging technology that provides information about different parts of the eye. For glaucoma assessment, the OCT provides analysis of the optic nerve thickness and identifies areas where the nerve is thinner and may be degenerating from glaucoma. This test is recommended for patients on their first visit and can be used to demonstrate progression over time if used sequentially. It is especially useful in patients with advanced disease or abnormal-looking optic nerves (from other conditions like high myopia). OCT and HRT imaging provide some different information. Both are extremely helpful in assessing and monitoring progression of glaucoma. GEM Clinic is very proud to offer these advanced imaging technologies to our patients. Currently, the cost of these tests is not covered by Manitoba Health. Is the eye pressure related to blood pressure? The eye pressure is different from the blood pressure. The eye pressure comes from the eye being a closed system that has its own production and drainage of fluid. This system keeps the eye in a normal range of pressure between 10 to 21 mmHg.